This study examined whether high school students found the Career Education course they took beneficial to them in regard to life skills, career selection, and other course work. The students perceived the value related to career selection. They also felt that the course was and will be of benefit to them, but the benefits related to life skills and application to other course work were not understood as well. The purpose of this study was to determine whether high school students found the Career Education course they took beneficial to them in regard to life skills, career selection, and other course work. The career development courses focus on awareness, exploration, and preparation for careers and the career world (Vocational Instructional Materials Laboratory, 1999). The study was designed to provide valuable information about whether or not the benefits of this curriculum were understood by the students who were taking the course. Similar classes have been offered on the college level and these students thought that their course had many positive features (Hayden & Ley, 1997). Secondary students were not sure if FCS courses should be part of their requirement for graduation (Cory, Etheridge, Hall, Jones, & Smith, 1998), but this is becoming part of the curriculum in many high schools today. Since these classes are new to the high school there has been an insufficient amount of information gathered on the career classes offered in the high schools. The hypothesis of this study is that a majority of students understand several of the benefits they gain from the class and evaluate the course positively. Due to time constraints the sample used in this research had not finished the entire semester-long course of Life Planning. Since the students had an additional five to six weeks left in the course they might not have understood all of the course objectives that had been presented to them and certainly none of the future objectives. All of the students included in the sample came from one high school. Each school teaches the curriculum differently and calls its Career Education course by a different name. 1. Career Education Course: a class offered by the FCS (or Home Economics) Department of a high school in which students examine different career paths they could choose among. 2. Life Planning Course: an elective Career Education Course offered by Madison Comprehensive High School. 3. School-to-Work Program: a governmental policy on the preparation of students for employment. 4. Career Pathways: the six categories that Ohio’s career focused curriculum used to divide and group all of the possible careers that a student could choose. 5. Career-Focused Education: Educational programming in which the curriculum content and learning experiences clearly connect to the world of work (Vocational Instructional Materials Laboratory, 1999, p. 38). Recently, the School-to-Work program has been implemented in the schools; this was the seed of a reformation in career education. The Family and Consumer Sciences Departments of Ohio high schools have begun teaching career education as a class within their curriculum to better meet the needs of their students. The School-to-Work program in one form or another has been in effect since the beginning of this century (Savickas, 1999.) The goals of the career education programs have been to ease the transition from the classroom to the world of work and prepare the student for employment. For this program to be successful, not only should the school be involved, but also the community and employers (Crowson, Wong, & Aypay, 2000). Education has always been a means to gain knowledge for work and other life opportunities. With the career/job opportunities becoming more diverse it is time to move from a standardized education to a customized education that allows the student to see and participate in more real- world applications. On May 4, 1994, President Bill Clinton signed the School-to-Work Opportunities Act. The goal of this Act was to create temporary funding for school-to-work programs. By creating temporary funding, the government intended for the schools to adopt this educational reform and create other funds through businesses and other sources to continue their particular School-to-Work program (Guest, & Charles, 2000.) Unfortunately, not very many of these programs have become self-sufficient, and the funding will come to an end in 2001. The curriculum within the School-to-Work program must integrate both academic and vocational learning processes. Students are required to participate in evaluations where they identify their own strengths and weaknesses in academics and the need to obtain additional vocational skills (Gray, 2000.) The goal is to get away from tracking college bound students and provide all students with academic and work place skills. A skills certificate could be earned by the student and would identify him or her as having obtained specific skills related to a particular occupation. Students are also given mentors to help them with work-based activities. The mentor acts as a liaison and relates information among the student, school, employer and parents (Gray, 2000.) This gives the student the opportunity to participate in real-world activities, and evaluations are more authentic. Gray also stated that the act provides no provisions for the education of interpersonal skills, and without these skills in the world of work students might find themselves being dismissed from their jobs. The education we have been providing students has not matched the employment needs of our country. In the last several years there has been a decline in traditional high-status jobs (Gordon, 2000.) One-third of students expect to be a professional, ten percent expect to be a sports or entertainment star, and another ten percent expect to be doctors (Gordon, 2000.) What these students do not know is that seventy percent of good jobs will not require the traditional four-year college education; instead they will require an associate degree or a technical training certificate (Gordon, 2000.) Gordon states that most of the new jobs over the next ten years will be created by the service, craft, and technical industries. One-third of all college graduates will be unable to obtain employment that matches their degree, and those with graduate degrees will out number employment opportunities by fifty percent (Gordon, 2000.) Currently there are 190,000 technical jobs vacant, and businesses have an increasing need for high-tech employees. With this knowledge in mind, it is time to adapt the educational objectives of our students and prepare them for the changing work force. Students that are graduating today do not have the math, reading, and technology skills to even succeed at a production job (Gordon, 2000). This means that not only do we need to focus the education reform on career skills, but also on academics. Schools have struggled to be responsive to the technology needs of the work world, but often the technology that is available in the schools has been outdated and teachers do not know how to use it. There are several theories on the application of this program that focus on how to gain experiences that can become marketable skills (Krumboltz & Worthington, 1999). These theories involve the participation of local governments, labor unions, higher education institutions, industry councils, businesses, the community, and parents. The first theory holds that investing in education will increase the human capital aptitude and skills, therefore increasing the nation’s economic well-being (Krumboltz & Worthington, 1999). This theory is based on the fact that workers who have better educational backgrounds do better in the job market, and countries who have larger pools of human capital tend to be more competitive in the world’s economy. The human capital theory calls for the School-to-Work program to produce a workforce that is highly productive and technologically sophisticated. Students are taught through objectives that include training activities, goal setting for career, and completion of high school with a diploma and a skills certificate (Krumboltz & Worthington, 1999.) Some of the limitations of this theory match those of the vocational programs. The economic focus of this theory loses sight of the academic excellence schools focus on; instead it focuses on the credentials the students should be trying to obtain for their skills certificate. The next theory presented by Krumboltz and Worthington (1999) is the learning theory, which was derived from Bandura’s social learning theory. This theory recognizes that students’ skills, values, and interest change as students continue to learn and interact with their surroundings. With this theory students are required to examine their definition of a satisfying life, then their education focuses on learning the qualities that can increase the student’s chances at success. In the career exploration of a student, he or she is usually given some type of assessment. If students are locked into the results of one of these assessments, then they are not given the chance to explore other interests or learn new skills. Instead, the learning theory approach will ask students what new interests or skills they would like to develop. This approach does not narrow the career exploration, but expands it. One of the limitations of this theory is the use of assessments because schools might try to focus learning on the identified interests and skills, instead of expanding upon them and offering new learning experiences (Krumboltz & Worthington, 1999). Family and Consumer Sciences Educators recognized the gap between the life skills they were teaching and the transition students made to the work world. FCS educators understand the importance of academic subjects, but they also understand the importance and need of being able to function in life (Austin, 2000). The core curriculum addresses many of the life issues a student will face. This is done through six core subjects, and career education comes under the subject of life planning. Smith, Hall, Jones, Cory, and Etheridge (1998) claimed that the human capital on which America builds its future is its students. Even students can see the relevance of learning job skills and recognizing that they are lacking in these skills (Smith et. al, 1998). FCS also recognizes the need for these skills in a world that is changing rapidly, possesses new priorities, and has higher expectations from its workers (Ohio Department of Education, 1999b). Career education has become a necessity for all learners. FCS saw an immediate need for “skills needed to compete in the global marketplace, credentials based on industry standards, capabilities needed to successfully enter, compete in, and advance through the present and future work force, and knowledge and skills for lifelong learning” (Ohio Department of Education, 1999b. p. 2). The process skills are broken down into four processes consisting of managing work and family, interpersonal skills, problem solving, and citizen and leadership skills. 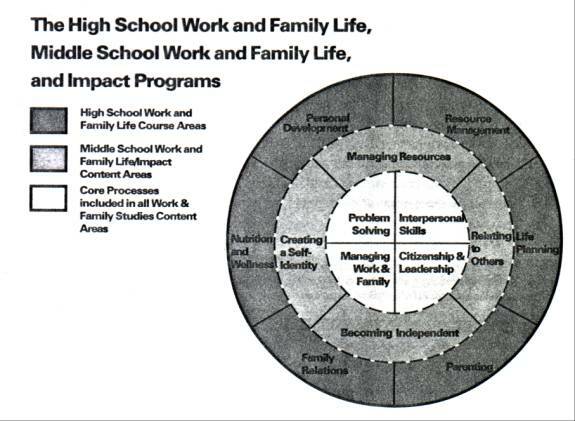 Each of these concepts are woven into each of the six core areas (Ohio Department of Education, 1998). Practical problem-solving addresses how to deal with complex ethical questions. Possible solutions are analyzed by the consequences on self and others. Practical action breaks down each concept into three parts: technical, interpretive, and reflective. The technical aspect of a concept is how it is done, or the process. The interpretative is understanding why and the shared meanings among the culture, and the reflective is analyzing and evaluating so that the student can make sound judgments. See Figure 1 for an illustration of the Work and Family Studies Program in Ohio. Note: Ohio Department of Education Division of Vocational and Adult Education Family and Consumer Sciences (1998). Work and family studies an implementation handbook for administrator and teachers. Columbus: The Ohio State University. p. 8. Ohio’s FCS career education has four priorities and they are: “Priority #1: Expand options for achieving career and educational goals; Priority #2: Strengthen teaching and learning; Priority #3: Enhance communication and collaboration with all stakeholders; Priority #4: Ensure a culture of continuous improvement and innovation” (Ohio Department of Education, 1999b, p. 3). A few of the critical components of the curriculum include having high expectations for students, increasing the participation of populations that are under represented, working with related initiatives such as the School-to-Work program, creating curriculum maps for the high school level that link school and work based activities and the integration of content, and instituting entry and exit points that are flexible and have a multiple focus (Ohio Department of Education, 1999b). The career education program has key components within the curriculum that better explain the expectations of the curriculum itself. They are career pathways, ITAC’s (Integrated Technical and Academic Competencies), and the use of technology with in the curriculum. Career Pathways. The career pathways are the educational experiences that lead to a career specialty. These experiences can be broke down into academic, technological, and occupational categories. The rationale for the career pathways is that all students need to be prepared for careers and education after high school both academically and technically. Students also need to be taught a wide range of transferable skills to use in the ever-changing dynamic market (Ohio Department of Education, 1999b). Career pathways will link the existing vocational programs and the post secondary educational options by helping students make informed decisions in regard to career selection. Career pathways will help students learn in a context where curriculum has a career focus academically and technically (Ohio Department of Education, 1999b). Career pathways will also allow students to select courses and other experiences to better meet their career goals. This is accomplished with collaboration of several entities and initiatives, including the School-to-Work program. ITAC’s. ITAC’s are the integrated technical and academic competencies. These are the curriculum objectives. They are grouped under the following headings: solving problems and thinking skillfully, communicating effectively, applying technology, working responsibly, planning and managing a career, and managing resources. Under each one of these groups you will find the indicators of the competencies (Ohio Department of Education, 1999a). For instance, managing resources contains eleven competencies. The first is “apply self-management in the work place,” and it has seven indicators including an organization system; time, anger, and stress management; an ergonomic work environment; maintaining productivity through the work environment; and resource management to obtain goals (Ohio Department of Education, 1999a). The ITAC’s attempt to address all possible learning objectives that would fall under the career-focused education. The ITAC’s also address the academic connections of their indicators. They give a percentage break down of how all of the indicators cover other academic areas including the arts, math, social studies, language arts, foreign languages, and sciences (Ohio Department of Education, 1999a). This break-down can be beneficial in determining how the career education course relates to proficiency tests. Integrating Technology. The use of technology allows students the opportunity to give their education some self-direction (Hayden & Ley, 1997). Technology could be used for many of the objectives found in the career educations courses. They might include focusing on a particular career path, cover letters, resumes, interviewing skills, time management, budgets, job searches, investigation of companies, and skill analysis. The World Wide Web offers an abundance of information on these topics, and there are several software programs that can assist students in these tasks. The career courses that FCS offers can be considered as part of the fulfillment of the school-to-work requirements for funding. Typically this course is geared towards sophomores so that the students can use the information to help them decide their career major before they become juniors (Gray, 2000). This particular course would only be a small portion of the school’s entire School-to-Work program because the School-to-Work program has implications before seventh grade. Educators, employers, and the government all concur that there is need for career education. These entities believe it is the solution that could offer the students the skills they need to succeed and have a satisfying life within the world of work. If the students do not understand the application of these skills or how they benefit from them personally, then they might not be getting all that they could out of these types of classes. The purpose of this study was to determine whether high school students found the Career Education course beneficial to them in regard to life skills, career selection, and other course work. Since these classes are new to the high school there has been an insufficient amount of information gathered and researched on the career classes offered in the high schools. The hypothesis of this study is that a majority of students understand several of the benefits they gain from the class and evaluate the course positively. The sample of students came from Madison Comprehensive High School. The students were enrolled in Mrs. Company’s Life Planning class. Three of the five classes received the questionnaire, Career Education Survey. From the three classes there were twenty-four participants. The majority of the students were sophomores and juniors and ranged in age from fifteen to seventeen. This sample was selected because the students were enrolled and were almost finished with the career education course at their high school. It was important for the participants to be currently enrolled in the course, because the nature of the course and the technology used is continually being updated. The sample was limited to three classes to keep data manageable. Mrs. Company’s first three classes of the day were selected. 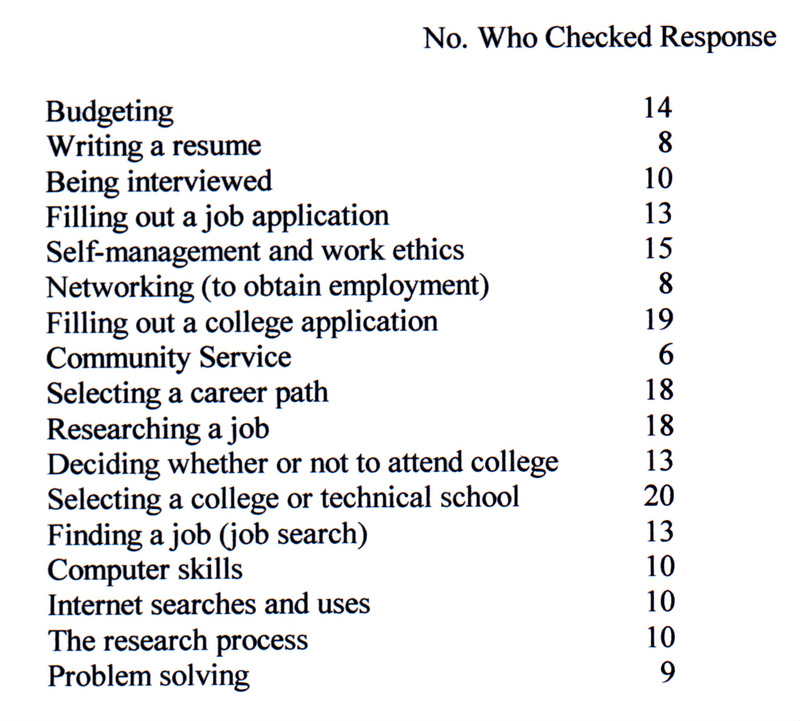 The instrument used in this research was a questionnaire called “Career Education Survey” and can be found in Appendix A. The questionnaire was selected because it was the quickest way to collect information during a class session with the least disturbance to the class and school day. The questionnaire contained ten questions. Questions one and two asked for demographic information, which was important in describing the sample. Question three was asked to determine if the student was coerced into taking the course or if he or she thought it would be beneficial to him/herself. Question four asked the students to make a value judgment on the course objective. Question five tested one part of the hypothesis. In this question the student had to select items from the course they thought would be beneficial to them. Question six asked them if they could relate any of the skills they have learned to other classes. This is an important aspect in understanding if the student understands the benefits of the class. Question seven asked them if they felt this class would be of value to them in the future; this is another way to see if the student understood the benefits of having this class. With question eight the students were asked to place an importance on the class in regard to the need of every student taking the same course. Question nine tested another part of the hypothesis by asking the students to rate the course by considering the effectiveness, importance, and the content. Question ten asked for suggestions on improvements that would be beneficial when modifying the course for the next semester. The method chosen to collect data consisted of contacting the teacher, Mrs. Company, who taught the career education course at Madison Comprehensive High School. After receiving her permission, the high school principal was contacted; Mr. Pea, and the vocational administrator, both granted their permission to conduct the survey. Then, two consecutive days in November were chosen for the survey to be conducted. On the first day the students were given a parent’s consent form and were instructed to bring it to class signed by the next day if they wished to participate in the survey. The students were told that it was a research project on career education classes and that they should give honest responses to the questions. They were also told that their answers were anonymous and could not be traced back to them. The next day students that returned the parent consent form were given the questionnaire during the first five minutes of class. All data collected were tallied. Questions one and two were totaled and the surveys tallied by grade in addition to an overall tally to see if there was a trend by age and grade. Questions three and six were totaled and listed by the most common responses to the least common responses. Questions four, seven, and eight responses were totaled and averaged. Question 10 responses were listed and the three most common responses were discussed. Because question five and nine tested the hypothesis, both had to meet the following criteria to accept the hypothesis. Question five had to have at least five of the seventeen options checked by seventy-five percent of the participants. Of the five items checked there had to be at least one item checked in each category by seventy-five percent of the students. In addition, question nine was totaled and averaged and had to have an average of 3.75 or higher. If the criteria were met on both question five and nine then the hypothesis was accepted. The twenty-four students who participated in the survey ranged in age from fifteen to seventeen. The ages were as follows: 13 out of 24 participants were fifteen years old; 9 participants were sixteen years old; and 2 participants were seventeen years old. The majority of these students were sophomores (21 out of 24 participants) but there also was 1 junior and two seniors. The majority of students (15 of 24 surveyed) chose to take the course because they thought they would benefit from it. Students also took the course because they thought it would be easy (10 of 24 surveyed) and because a previous student recommended it (10 of 24 surveyed). Eight of the students needed another class in their schedule and 7 of 24 students stated that a counselor recommended the course. Only three of the students said a friend recommended they take the course, while none of the students took the course on a parent’s recommendation. This information is presented in Figure 2, which indicates the response of why students choose to take the Life Planning Course. A majority of students (15 of 24) believed that it was very important to learn the skills of career selection, while 9 of the 24 students believed it was somewhat important, and none believed it was unimportant. Twenty-one of the twenty-four students felt the class would help them in the future, but only nine of the twenty-four thought it should be required for graduation. Not all of the students believed that they had learned skills that would apply to other course work. Twelve of twenty-four students believed that they would use the computer skills they learned in this class in other course work; ten of twenty-four students believed that they would use the internet skills they learned in this class in other course work; eleven of twenty-four students believed that they would use the research process they learned in this class in other course work; nine of twenty-four students believed that they would use the problem solving skills they learned in this class in other course work; six of twenty-four students believed that they would use the resume writing skills they learned in this class in other course work; eleven of twenty-four students believed that they would use the budgeting skills they learned in this class in other coursework. The students were given a list of concepts in three different categories. The categories were life skills, career selection, and application to other course work. A majority of students (19 of 24) checked five or more of these concepts, and 15 of the 24 participants checked at least one item from each category. Table 1 lists each of the concepts and the number of students who checked that response. It indicates the number of students who believed that the following concepts would be beneficial to them in the future. The course received an average rating of 3.54 (out of 5) with 7 of the 24 students giving it a rating of 5; 6 giving it a rating of 4; 6 giving it a rating of 3; 3 giving it a rating of 2; and 2 giving it a rating of 1. Of the twenty-four students only ten made comments. Five of the ten who made comments said that the class was boring or needed to be made more interesting. Two of the ten comments pertained to job shadowing and two suggested more field trips. The following is a complete list of comments. · I think there should be more job shadowing or trips to actually get out in your interested field to see what it’s like. · Don’t be boring and have more fun. · Field Trips for everyone. · To go on more field trips. · This class is so boring! I shouldn’t have taken it. When you do it, make it fun. · Since I am a senior, a lot of the vocational studies we spent a lot of time on do not affect me, since I am already enrolled in cosmetology. Maybe they could have a Life Planning just for seniors. · Make more interesting. (Too much talking.) Go around and visit, see what classes we should be taking next year, see what they are like. · Make it more interesting. · No, I think its fine. I would have job shadowing be something that we had to do for a project though. · To make it more interesting, but I like it. Students did believe that the course was and will be of benefit to them in the future, just not to the extent to accept the hypothesis. For the hypothesis to be accepted two criteria had to be met. First, at least five of the possible seventeen benefits had to be selected and each of the three categories must of had at least one item checked by seventy-five percent of the participants (18). Second, the average overall rating had to be at least a 3.75. Nineteen of the twenty-four participants did select five or more of the benefits, but only fifteen of the twenty-four students checked at least one item from each category. For the second part of the hypothesis the average overall rating was a 3.54. Therefore the hypothesis was rejected. Overall, students believed that it was important to take this course for their future. They knew that they would benefit from the concepts that are taught, especially in regards to career selection. Although students knew that they would benefit, they did not understand what the benefits were. At best only half of the students could relate the skills they were learning in this course to other coursework. Of the six applicable skill choices, all were skills that carry over to other coursework, including but not limited to the sciences, mathematics, language arts, and social sciences. The top four ranking benefits were learning how to select a college or technical school, select a career path, research a job, and self-management and work ethics. This was encouraging because the students chose the most important concepts as benefits. At the same time students rated networking and resume writing as low benefits in the course. That is probably because they did not comprehend the power of those concepts in obtaining employment within their chosen career. The overall rating of the course was affected by the lack of interesting presentations of information. At this time the course was still so new to this school district that the teacher was still working on the content and had not had the chance to spice up the presentation or student acquisition of information. I suspect that if the students were just asked to rate the course on the content it would have received a higher rating. The implications of this study were that students understand some of the benefits they gained from the Life Planning Course and they need to be educated on the importance of some of the other concepts that are covered within the course, such as networking and resumes. Since students know that they will benefit from the course and previous students are recommending the course, it appears that the school will have no problem keeping a high enrollment in this course. Students believed learning how to fill out job applications and college applications to be a benefit of this course. This proves that even though society might consider these skills to be common sense, the students think they should be taught in the classroom. The biggest challenge the teacher of this course faces is how to add more appeal and zest to the course itself. Students have suggested more field trips into the career world; this might be a good place to start. One of the limitations of this study was that students had to be relied upon to get their parental consent forms signed and return them the following day to participate. Only 40% of the students returned the parental consent form signed. Another limitation of the study was that the students had not finished the semester; therefore they did not understand all of the terminology and concepts presented on the questionnaire. Crowson, Wong, and Aypay (2000) stated that career opportunities are becoming more diverse and it is time to move from a standardized education to one that allows students to see and participate in real-world applications. Even some of the participants in this survey addressed the need for more field trips to see what is out there in the career world. One student commented that job shadowing should not be an option for this class but a requirement. These students wanted more opportunities see careers and employment in real-world applications instead of the traditional lecture. Gray (2000) stated that the School-to-Work program provided no provisions for the education of interpersonal skills. The Family and Consumer Sciences Curriculum has not only integrated this concept into its curriculum, but has created a whole strand called “working responsibly” within the career focused ITACs (Ohio Department of Education, 1999a). Mrs. Company has worked this concept into the content of her course, and a majority of students believed that addressing this concept in this class would benefit them in the future. Smith, Hall, Jones, Cory, and Etheridge (1998) claimed that students can see the relevance of learning job skills and recognize that they are lacking in these skills. Not only did a majority of the participants feel that career selection was a very important skill to learn, but also twenty-one out of twenty-four knew that this class would be of help to them in the future. Therefore the participants of this study agreed with the statements of Smith et. al. Because of the nature of the course, technology is a must to keep up with the ever-changing world of work. Hayden and Ley (1997) claim that technology allows students to give their education some self-direction. In this class technology allowed students to customize their education selection and research of a career path, job searches, and resume writing. Unfortunately, only half of the students that participated in this study could see how computer skills could be linked to other course work, and less than half understood the benefit of computer skills and Internet uses for their future. Overall, students believed that it was important to take this course for their future. Students also believed learning how to fill out job applications and college applications to be an asset of this course. Unfortunately, students rated networking, and resume writing low, because they did not comprehend the power of these concepts in obtaining employment within their chosen career. The overall rating of the course was affected by the lack of interesting presentations of information and concepts. The hypothesis of this study was that a majority of students would understood several of the benefits they gained from the class and evaluate the course positively. To accept the hypothesis, at least five of the possible seventeen benefits had to be selected and each of the three categories must have had at least one item checked by seventy-five of the participants (18). Also, the average overall rating for the course had to be at least a 3.75 (out of five). Nineteen of the twenty-four participants did select five or more of the benefits, but only fifteen of the twenty-four students checked at least one item from each category. For the second part of the hypothesis the average overall rating was a 3.54 (out of five), therefore the hypothesis was rejected. The effectiveness of the research was compromised by the lack of participation of those students who failed to return the parental consent form. To have only twenty-four students represent a course that is offered by two teachers for a total of eight class periods a day is not a fair representation of the Life Planning Course. The survey would have been much more effective had it been administered during the last week of class when the students had finished conducting their research on the career of their choice, but the data was collected earlier to enable the researcher to complete the study in one semester. The research process tied together all of the information they have learned throughout the course and allowed the student to apply it in a real-world application. After completing this process the student might have a better perception of the benefits of the course and they might have rated it higher. 1. Repeat the same study “High School Career Education: Student’s Perceptions of the Life Planning Course” at Madison High School using a larger sample, a different school district, or several school districts. 2. Conduct a study on the different FCS curriculums at different schools and whether or not they meet the criteria for the School-to-Work program and follow the FCS Career Focused ITACs. 3. Conduct a study that evaluates the student’s needs or identifies the student’s difficulties within the career education courses, that identifies the top ten employer’s needs of a student that graduates with a tech prep degree, or that identifies employer’s top ten problems in regards to the employment of high school students. 4. Conduct a study in which teachers evaluate the resources available to teach career education courses or evaluate the student’s success with the career education course. Austin, E. (2000). No place like home. American School Board Journal, 44-47. Cory, J., Ethridge, T., Hall, H., Jones, K, & Smith, B. (1998). Students: Consumers of family and consumer sciences. Journal of Family and Consumer Sciences, 15-17. Gordon, E. (2000). Help wanted: Creating tomorrow’s work force. Futurist, 34, 48-53. Gray, D. (2000). Shaping America’s workforce for the new millennium. Education, 120, 631-634. Guest, JR., & Charles, L. (2000). School-to-work program. Education, 120, 4, 614-621. Hayden, M., & Ley, C. (1997). Collaborating with technology: Teaching a class on the World Wide Web. Journal of Family and Consumer Sciences, 89, 25-27. Krumboltz, J., & Worthington, R. (1999). The school-to-work transition from a learning theory perspective. The Career Development Quarterly, 47, 312-325. Ohio Department of Education Division of Vocational and Adult Education Family and Consumer Sciences (1999a). ITAC integrated technical and academic competencies for career-focused education. Columbus: The Ohio State University. Ohio Department of Education Division of Vocational and Adult Education Family and Consumer Sciences (1999b). Career pathways implementation guide. Columbus: The Ohio State University. Ohio Department of Education Division of Vocational and Adult Education Family and Consumer Sciences (1998). Work and family studies an implementation handbook for administrator and teachers. Columbus: The Ohio State University. Savickas, M. (1999). The transition from school to work: A developmental perspective. The Career Development Quarterly, 47, 326-336. How important is it to learn the skills of career selection? For Questions 7 – 9 please circle your response. Do you have any suggestions on improvement for this class?